Laurent Lloyd Phillpotts was born in St Ann’s, Jamaica on 30 August 1922. He joined the R.A.F. in 1943 and arrived in Britain a year later. During the war, Phillpotts completed a basic training course in Filey before moving to another R.A.F. base in Britain to serve as a teleprinter operator. After he was demobilised in 1947, Phillpotts enrolled at Leeds College of Technology. On completion, he found work in Britain. Although, he did not return to Jamaica, the ex-servicemen never forgot his Caribbean roots. Thus, when the West Indian men arrived on board the Empire Windrush in 1948, he helped them start a new life in Britain. Phillpotts was also a champion of equality and become heavily engaged with Nottingham Consultative Committee for the Welfare of Coloured People. In 1956, he produced the first ever Black weekly newspaper called Colonial News to provide information about the West Indies and life in Britain. It addressed issues such as racism and how to generate better race relations. Despite the newspaper’s success, Phillpotts had always dreamed of working at a top London newspaper and thus moved to the capital in the 1960s eventually securing a position at the Daily Mirror. While in London, Phillpotts also helped set up the West Indian Association of Service Personnel and continued to be their public relations officer until 1995. Phillpotts died on 11 January 2016, aged 93. Carl Chantrielle joined the R.A.F. in 1943 and made his way to Britain the subsequent year. After landing in Liverpool, Chantrielle travelled to Filey as part of contingent of 1,000 West Indian volunteers. He completed his basic skills course in East Yorkshire before moving on to train as an encoder in the R.A.F. Signals Unit. After the war, he was repatriated and later became president of Cable & Wireless in Jamaica. Sam King was born at Priestman’s River, Jamaica c.1926. In November 1944, he landed in Greenock with a large contingent of men from the Caribbean to work as ground crew for the R.A.F. Shortly, after their arrival they were transported to Filey, where King completed approximately 12 weeks of basic training. He was then posted to RAF Hawkinge, near Folkestone where he served as an aircraft fitter. During the latter stages of the war he travelled to different bases around Britain. After the Second World War had ended King was repatriated to Jamaica. However, as labour opportunities were scarce in the Caribbean but plentiful in Britain, King boarded the Empire Windrush and arrived back in England in 1948. In 1952, King married Jamaican nurse Mae Kirlew and the couple had two children. King was heavily involved in community and migrant welfare issues from the 1950s. He became increasingly involved in the Brixton based newspapers West Indian Gazette and Afro-Asian Caribbean News and joined the Labour Party. In 1982, King embarked on a successful political career after being elected as the Labour member of Southwark Council for Bellenden Ward, Peckham. The following year, he became the First Black mayor of the London borough of Southwark. In 1998, King’s services to the country were acknowledged with an MBE. Eleven years later the people of Southwark demonstrated that King was a much-loved part of their community and voted for a blue plaque to be installed on his former home. Sam King died on 17 June 2016. Jamaican born Cecil Holness was 22 years old when he joined the R.A.F. Like many West Indian recruits, he wanted to escape island life and go on an adventure. He arrived in Liverpool in June 1944 and was taken to Filey where he completed his basic training. After this Holness was moved to another station were he trained as an aircraft fitter as well as an office administrator. When the Second World War ended, Holness continued to work as a volunteer in the R.A.F. until he was sent back to Jamaica in January 1948. However, like many service personnel from the West Indies, he did not stay in the Caribbean for long. Four months after his repatriation, Holness voyaged back to Britain on the Empire Windrush. Years later Holness attended Avery Hill College in Greenwich and eventually became a youth worker in Brixton. Alongside his career, Holness has played an active role in keeping the memory and sacrifice of the recruits from the Caribbean alive as a founding and pivotal member of the West Indian Ex-Service Association. 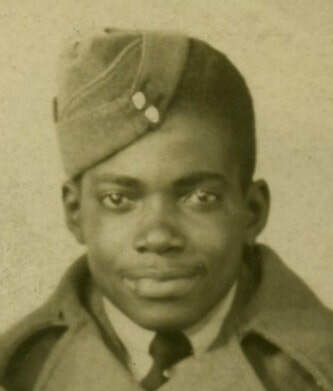 Jamaican born George Row joined the R.A.F in 1944. He travelled to Britain alongside Laurent Phillpotts although the pair did not know each other at that point. Shortly, after landing he was sent to R.A.F. Hunmanby Moor where he trained for approximately 12 weeks. Much like many of the men who served in the R.A.F from the Caribbean as ground crew very little is known about Row’s life or career. However, he left an important legacy in Britain. Row’s son Marc Wadsworth is an anti-racism activist and journalist who has played a pivotal role in combating inequality and fighting for justice. He has also been central to bringing the story of the West Indian volunteers to life in the excellent documentary Divided by Race, United in War and Peace. Earl Barrington Beckford was born on 13 October 1925 in Kingston, Jamaica. In 1944, at the age of 19, he answered an advertisement to join the R.A.F and ventured to Britain via Newport News, Virginia the same year. His vessel arrived at Liverpool and shortly after he was escorted with the rest of the West Indian recruits to R.A.F. Hunmanby Moor, Filey. In an interview, Bedford’s strongest memory of being at the East Yorkshire training camp was the inadequacy of the food. He remarked, that the sandwiches issued to the troops had their crusts removed so that they could be kept for snacks which the men queued up for after physical training sessions. Once Bedford had finished his basic training, he sat an aptitude test which matched him to the role of Radar Fitter. To complete the course, he was moved from Filey to Glasgow Royal Technical College where he was based for six months and then R.A.F. Taresbury Radar School in Wiltshire. He also worked for a short time in Coxford, Norfolk County. After the war, Bedford worked on aircraft which travelled to the Far East. He then applied and gained a scholarship to study Civil Engineering at South West Essex Technical College and School of Art. Once in possession of his qualifications he worked for the boiler company Babcock and Wilcox. Bedford returned to Jamaica in 1958, after 14 years in Britain where he had gained many skills. He took up employment as an Executive Engineer with the Ministry of Public Works. In 1944, Jamaican Vivian Blake joined the R.A.F. to help Britain and the Allied forces. In the same year, he embarked on a vessel that took him to Virginia where he met the rest of the Jamaican recruits. At this time, America remained segregated and racial discrimination was rife. In an interview for the World War II series People’s War, Blake remembers that the West Indian volunteers were put with the white American soldiers which caused some hostilities. On one occasion, he heard a white officer remind his men that "These ain’t Uncle Sam’s Niggers, these are King George’s Niggers." After a short stay in Virginia, the men were shipped to Liverpool where they were greeted with cheers. Blake was then moved with his contingency to Filey, where he completed his basic training. He was then posted to Causwell in Scotland, where he passed a course in air and sea rescue. During the final year of the war he was posted to various stations. Blake eventually left the R.A.F in 1948. Although, it had always been his intention to return home after the global conflict had ended, Blake remained in Britain working first for British Rail before beginning a career as an engineer. He eventually settled in Gloucester with his family in 1960. Jamaican Histon Boreland joined the R.A.F. in 1944 when he was 18 years old. On 16 May he boarded the S.S. Cuba which sailed to Newport News, Virginia. After a short time, all of the West Indian Volunteers were all put on a train to New York where they embarked on the S.S. Arawa and began their journey to Britain. At this time, the Atlantic was a theatre of war in which submarines were used to sink enemy vessels. Histon remembers that a submarine was sighted when the ships were halfway into their voyage which split the ships so that they were no longer in convoy. Thankfully, Boreland arrived safely in Liverpool in June 1944. He was then taken to Filey where he completed his basic training. After, his short stint in East Yorkshire, the Jamaican trained as a motorcyclist and travelled to various bases throughout the war. In October 1946, he was posted to R.A.F. Innsworth, Gloucester where he remained until 1949. In the same year, he married Vilma C. Paradise whom he had met at a local dance. Boreland left the R.A.F. in 1952 and started a career as a driver before going on to complete a Government sponsored training course as a welder and working at Gloucester’s Wagon Works. Hedley Jones was born on 12 November 1917 in Jamaica. In 1936, he was employed as a proof reader for the Jamaican Times. One day, he found himself in the newspaper’s music department which resulted in his obsession with electric guitars. At the age of 23, Jones changed the sound of Jamaican music when he invented the first commercially available electric guitar (Click on the following link to to hear Jones speak about his invention https://www.youtube.com/watch?v=SYz1MqeGH_c). However, when the R.A.F began to recruit in 1943, Jones decided to put his promising career as an inventor and musician on hold to support Britain and the war effort. On 8 May 1943, Jones applied for the radio engineering trade in the R.A.F. however, despite his skills and Jamaican qualifications, he was advised that this was not possible. Thus, Jones decided to put his name forward as part of the pool of potential electricians. Shortly, after he was called up, Jones was prepared for life in the services at the Palisadoes Military Training Camp, Port Royal before he was posted to the Up-Park Camp in Kingston for military fieldwork. Exactly one year later, he was sent, with 2,000 other Jamaican recruits to America on board the S.S. Cuba. After a short stay in Virginia, the men made their way to New York and then to Liverpool where he arrived on 18 June 1944. He was then taken to Filey for basic training where he stayed until August. In the East Yorkshire camp, Jones was put through a series of tests which eventually enabled him to train as a radar engineer. He was then posted for training at the Royal Technical College in Glasgow with 22 other West Indian volunteers from Filey. After intensive training at a range of bases, Jones eventually graduated from the No. 3 Radio School. He continued to be employed by the R.A.F until after the war had ended. On 8 May 1946, Jones together with other West Indian R.A.F recruits embarked on board the S.S. Bergensfjord and sailed for the Caribbean. Once repatriated, Jones opened a music shop where he sold records, equipment and repaired instruments. In 1947, he also built his own sound system. Alford Gardner was one of 13 men who joined the R.A.F. in June 1944. His reasons like many young men were for the adventure, to see the world and possibly learn to fly, whilst also helping Britain during the global conflict. Once he had passed a series of tests, Gardner boarded the S.S. Cuba which took him to America where he met the rest of the West Indian Volunteers before they made their way to Britain. After disembarkation, Gardner was taken to Filey where he trained as a motor mechanic. In an interview with Roger Dawson, Gardner commented on the experience of the West Indian recruits in the East Yorkshire town. He said, ‘There were just about 1,000 of us, and so many different colours. That was one of the things that baffled them, so many shades of black and they were all talking the same way, all Jamaicans.’ While the spirit of war tamed racist attitudes, Gardner also highlighted that on occasions there were scuffles because somebody said something out of turn that the men did not like. Clifford Samuel Hall was born on 11 September 1925 to Cuban and Jamaican parents. Although, he was born in Oriente Province, Cuba his family moved to Jamaica in 1939 when he was 14. In November 1944, Hall arrived in Scotland before being sent to Filey for basic training. In the final year of the war, he delivered aircraft parts before enrolling on an electrical training course in Leeds. In 1947, Hall was demobilised and sent back to Jamaica leaving his wife, whom he had married only days before, in Britain. However, in 1948 he returned to England and the couple had three children. In 1953, he met Tony Davis and by May 1958 the duo had formed a group with Mick Groves and Hughie Jones which eventually became the folk band, The Spinners. The band retired in 1988 after great success. Hall died on 26 June 2008 in Adelaide Australia at the age of 82. Noel Hawkins joined the R.A.F. and travelled to Britain via America in 1944. Once he had disembarked in Liverpool, he was transported to Filey where he completed his basic training. After he had undergone tests to determine his skill set, Hawkins was sent to the Royal Technical College in Glasgow to train as an airborne radar mechanic. Once he had successfully completed the initial course, he was then taken to Yatesbury and Cosford to build upon his expertise. After, Hawkins successfully passed all of his exams, he was posted to R.A.F. Pershore, near Worcester then Wymeswold and lastly R.A.F. Brize Norton, where he checked the radar equipment on board aircraft until he was demobilised in 1948. Jamaican George Mason was only 18 years old when he joined the R.A.F. 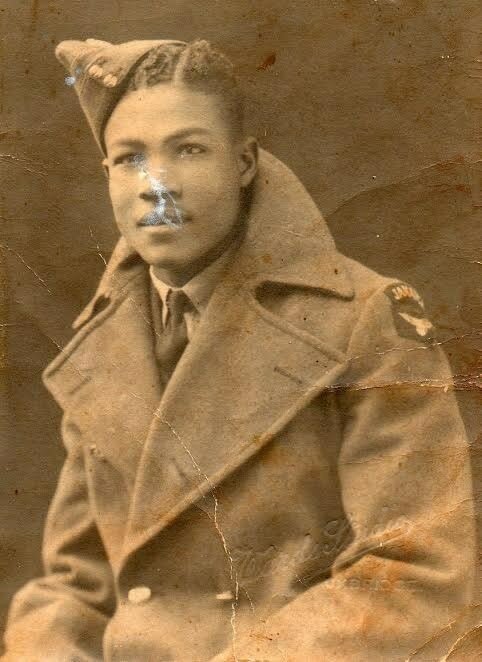 He travelled to Britain in 1944 and was directed to Filey with the other West Indian recruits. The weather and climate in East Yorkshire was far from what Mason was used to especially in November. He remembers waking up around noon the day after he had arrived at the camp and thinking how dark and miserable it was outside. During the war, Mason trained as an ammunition and later fuel specialist. After the conflict had ended, he was repatriated. However, when he returned to Jamaica the belief that there was work in Britain brought Mason and 499 other migrants from the Caribbean to England on board the famous Empire Windrush. Barry Reynolds was born in Negril, Jamaica c.1925. His father was a fisherman and his mother a seamstress. He attended a government school in his hometown before enrolling at a college in Kingston. While he was there, he was asked whether he wanted to join the R.A.F and go to Britain. The possibility of adventure no doubt excited 19-year-old Reynolds so he agreed. Once he had completed his basic training, Reynolds was posted to Morton-in-the-Marsh in Gloucester. Here, he began the important job of flying control, speaking to the pilots from the ground and telling them whether they could land. Sadly, Reynolds remembers that not all pilots were alive when they landed and the men had to put their bodies into bags so they could be sent for burial which naturally upset him. During the war, Reynolds met a local woman in Bolton and they married during the war. He has only ever been back to Jamaica for a holiday as once the global conflict ended he classed Britain as his home. List of men who trained at Filey. Other men that trained at R.A.F. Hunmanby Moor, Filey include: Carl Brewster, Bob Roach, Stanley Hodges, Pasteur Irons, George Powe, Gerald Beard, Byron Martin, Wilfred Octavius Dawns, Alex Elden, Maurice Fowler, Ronald Fowler, Gilmour Westcarr, Donald Jones, and Patrick Constantine Marshall. Despite pursuing multiple lines of enquiry, unfortunately a surviving list with each contingent of men who travelled to Britain as R.A.F. ground crew has not yet been found. Therefore, if you know anything about these men or have a name to add to our list so we can expand their story, please click HERE. Mark Johnson, Caribbean Volunteers at War: The Forgotten Story of the RAF’s ‘Tuskegee Airmen’ (Barnsley: Pen and Sword Aviation, 2014), p. 30-31. The Guardian, 'Sam King Obituary', 30 June 2016, https://www.theguardian.com/society/2016/jun/30/sam-king-obituary accessed 15/04/2017. Foundation SKA, ‘Pioneer Hedley Jones’ http://skabook.com/foundationska/2014/12/pioneer-hedley-jones/ accessed 25/05/17. Roger Dawson, A Jamaican in the British RAF- Alford Gardner’s Tale, unpublished document, pp.1-2, p. 1.